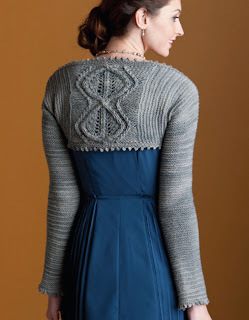 Since my book, Finish-Free Knits, is now available (squee!!! ), I'm going to share with you a little bit about the creation process of each of the designs, sharing one design from the book each week. With the holidays coming, I figured a great place to start would be with the Serenity Shrug. This is the perfect garment to add a touch of evening-night-out elegance. 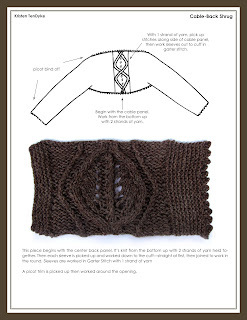 It begins with a cable panel at the center back, which is worked with two strands of yarn held together, then stitches are picked up along the sides of the panel and the sleeves are worked (with a single strand of yarn) to the cuffs. A stretchy picot bind-off around the cuffs and body opening provides a feminine edge with a comfy fit. I love this lacy cable panel. I've also used it in my Petal Socks pattern. This shrug was designed with the intention of highlighting this elegant lace and cable panel, with pretty picots and simple garter stitch. Knit with 2 strands of yarn held together the bulky yarn enlarges the panel to spread beautifully along the center back. 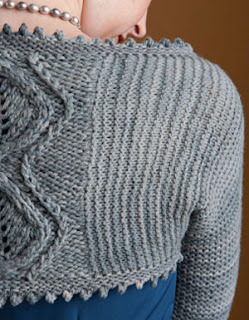 The single strand of yarn used for the garter stitch and picots adds a more subtle and finer touch to the shrug. The stitches for the sleeves are picked up along either side of the lace cable panel and some stitches are increased along the neck edge. I opted to include these increases so the center back panel could be short and sweet—fitted, and without extra fabric. To make it so the underarm circumference would also fit comfortably, these stitches needed to be added before working the sleeves. I choose to work a picot edging around the body because binding off in this manner gives a nice stretch to the edge. I tried out a few different ideas for a stretchy bind off, and this one seemed to give the nicest stretch with an appearance that flattered the rest of the design. To tie it all together, I added the picot to the sleeve cuffs as well. To help with picking up the stitches for the body trim, the book includes a tip for how to pick up a lot of stitches! I am very confused with this pattern. It says 'cont as established until a total of 51 rows have been worked, ending after Row 3 of chart. How can I do 51 rows with only Row 3 on the chart? 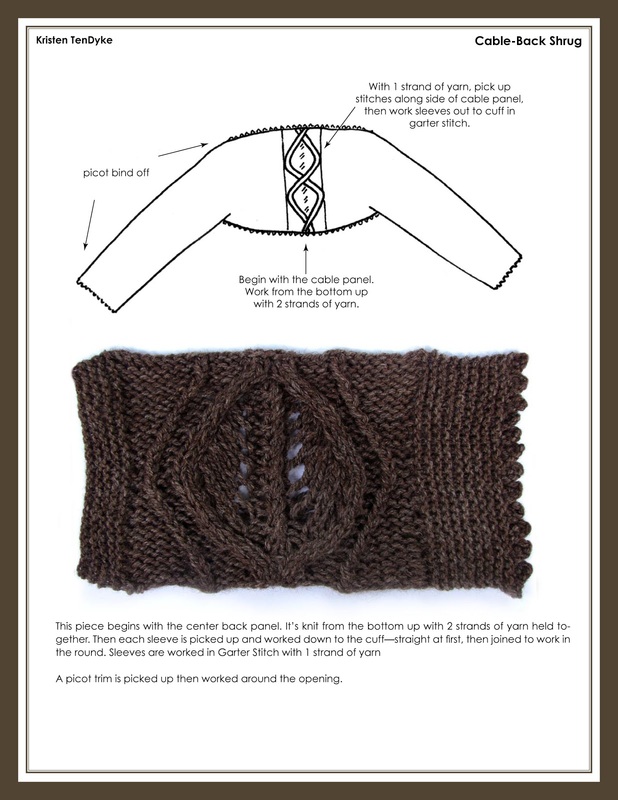 Please help, I would like to do this pattern! There are 24 total rows in the chart, you'll work the whole chart through twice - giving you a total of 48 rows, then you'll work Rows 1, 2 and 3 again. for 51 rows.